Erected by Borough of Clarks Green. Location. 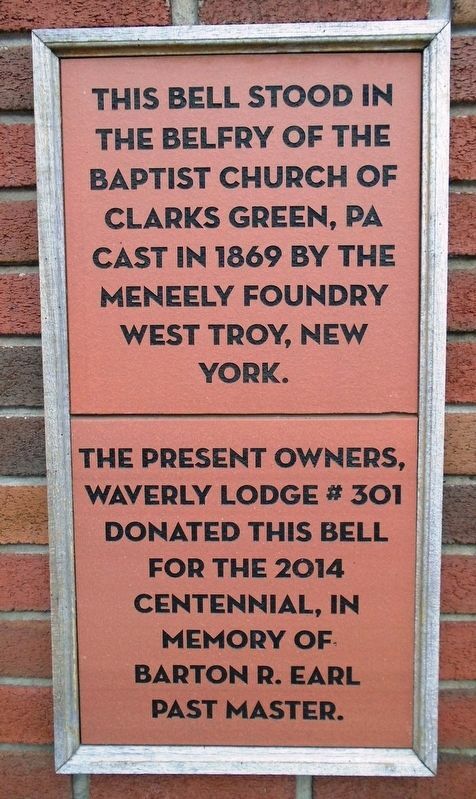 41° 29.916′ N, 75° 41.756′ W. Marker is in Clarks Green, Pennsylvania, in Lackawanna County. Marker is at the intersection of North Abington Road (Pennsylvania Route 407) and Glenburn Road, on the right when traveling north on North Abington Road. Touch for map. 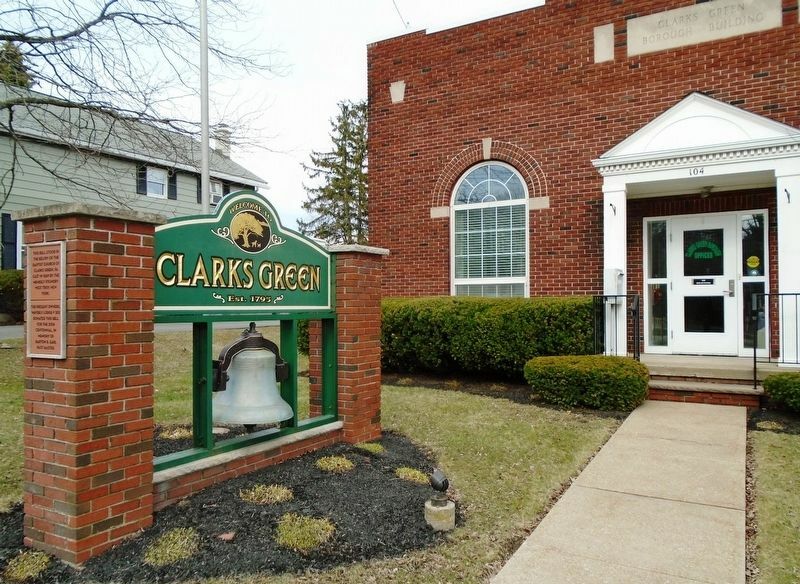 The bell stands in front of the Clarks Green Borough Office. Marker is at or near this postal address: 104 North Abington Road, Clarks Summit PA 18411, United States of America. Touch for directions. (approx. half a mile away); Veterans Memorial (approx. half a mile away); War Memorial (approx. 1.4 miles away); South Abington Township World War II Memorial (approx. 1.8 miles away); Hickory Grove Cemetery (approx. 1.9 miles away); Elder Miller (approx. 2.1 miles away); St. Joseph Catholic Cemetery Association Charter Members (approx. 4½ miles away). Regarding Baptist Church Bell. The Waverly Masonic Lodge #301 meets in the former Baptist church at 118 North Abington Road, just north of the borough office. More. 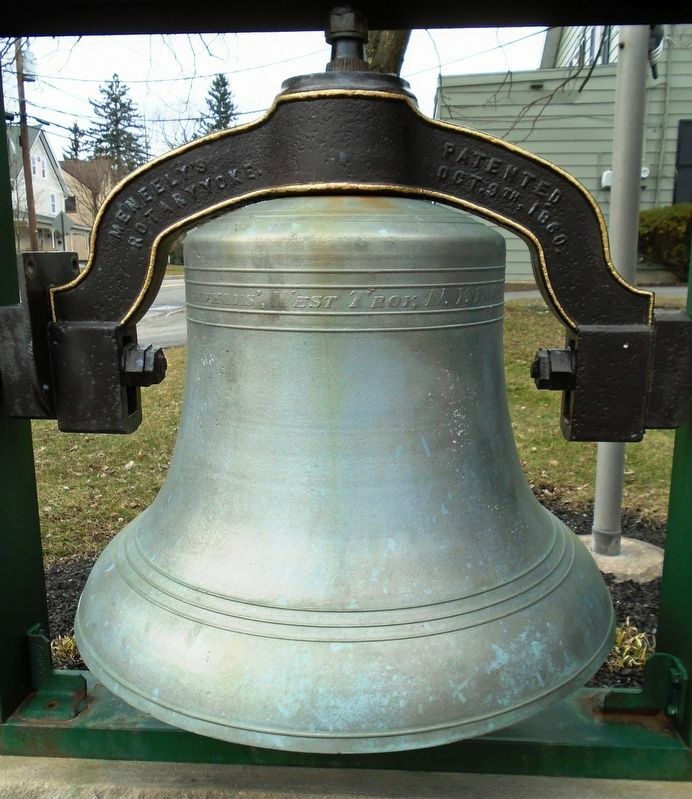 Search the internet for Baptist Church Bell. Credits. This page was last revised on March 30, 2019. This page originally submitted on March 30, 2019, by William Fischer, Jr. of Scranton, Pennsylvania. This page has been viewed 76 times since then. Photos: 1, 2, 3. submitted on March 30, 2019, by William Fischer, Jr. of Scranton, Pennsylvania.